There aren't many among us who can deny the charm and delightful, creamy allure of the avocado. It turns a so-so one and ordinary toast into . It's the ultimate all-in-one food, both nutritious and delicious. There aren't many fruits that can be used to make sweet and savory meals either, but the avocado swings both ways—? While it certainly has a myriad of endearing qualities, there's one we're not so keen on: its rapid oxidization, aka that brown layer that surfaces soon after it's opened. You either eat the whole avocado in one sitting or you try one of the many hacks out there to store it. But which one do you go with? Some people advise keeping the seed in and putting that in the fridge while others swear by lemon brushed on top, but which one really works? And keeping it from going brown isn't the only thing we want to know. I mean, we have so many questions: Can avocados be frozen? Is there a secret to picking an avocado? And what's the best way to cut an avocado—or is peeling it better? "Avocados ripen off the tree, so don't worry if they're a little firm when you buy them. In fact, it's best to buy them a little underripe, unless you need to cook with them the same day. To check out whether an avocado is the perfect ripeness for eating fresh, check the stem. Use your index finger to slightly push down on the stem. If the stem strongly resists, the avocado isn't quite ripe. If it sinks in too easily, it's overripe. It should give just a little resistance. "You can also lightly pull on the stem, to check the ripeness. If the stem nub doesn't come off easily, the avocado is not quite ripe yet. If it comes off easily and is light white-green underneath the stem, the avocado is just right. If it's brown under the stem (or the stem is missing and looks dry and brown), the avocado may be overripe. "You should also carefully cradle the avocado in the palm of your hand and very gently squeeze to make sure there are no hollow spots under the peel." "The best way to slice an avocado is to make a careful cut lengthwise from stem to end, letting your sharp knife roll around the pit. Gently rotate the two halves (still connected by the pit) to separate. Use a chef's knife to carefully whack the pit, which will wedge the pit on the blade. Then give a little twist, and the pit will easily pull out. "To keep the half avocado intact, make a small cut just below the stem and then gently pull the peel away, similar to how you'd peel a banana. This is called the 'nick and peel' approach. "To make slices, you can use the 'nick and peel' approach or leave the avocado in the peel, and gently slice through the avocado flesh with horizontal strokes using just the tip of the knife. Try not to pierce the peel (but don't worry if you do). Then, pull away the peel, starting at one end to release the slices. "To make cubes, slice the avocado in the peel as you would if you were making slices, but slice both horizontally and vertically. Use a spoon to gently pull back the peel and scoop out the avocado cubes. Do try to get as close to the peel as possible, as that's where most of the phytonutrients are! "For avocados with thinner peels, it may be easier to peel the avocado once it has been cut in half before slicing or cubing." "You can store unripe avocados at room temperature for up to a few days. When an avocado is ripe, you can slow the aging by storing it in the refrigerator for a day or two. Once cut, you are fighting a battle between oxidation and the avocado's beautiful green flesh. It's a myth that leaving the pit in the avocado will prevent it from browning (at least anywhere that isn't covered by the pit). The trick is to keep air off of the avocado flesh as much as possible, so it's better to remove the pit, brush it with a little bit of avocado (or olive) oil, and wrap it tightly with plastic wrap, or use one of those nifty avocado keepers that have a bump for the pit hole to create a complete seal on the half of an avocado (you can find them in specialty kitchen shops or on Amazon.com). "Lemon or lime juice brushed on the avocado flesh can also help slow the browning process. There's also a rumor that storing an avocado in an airtight container with a slice of onion or a peeled clove of garlic helps keep the brown away, due to the sulfur compounds that get released. In my tests, I saw no improvement to the avocado when stored with onion, so I recommend sticking with simply wrapping the avocado as tightly as possible to keep the air off of the surface." "You can also freeze avocados to use in smoothies, sauces, or baked goods. … To freeze an avocado, slice it into cubes, and then place the pieces in a single layer on a waxed paper–lined baking sheet that will fit in your freezer. Freeze the avocado cubes until they're solid, about thirty minutes, and then transfer them to an airtight container that you keep in the freezer. To defrost, place the cubes you need in a bowl of water until thawed, five to ten minutes, and then drain. Unless specified, you should defrost any frozen avocado." Now that you know all the tricks, it's time to whip up some delicious avocado recipes! Ferroni shared five of her favorites from the book and we can't wait to make the yogurt! "If you rarely roast a whole chicken because you don't know what you'd do with the leftovers, this chicken salad recipe may just give you the needed motivation. It's also great with leftover turkey!" "Replacing the cheese with avocado makes a just as delicious but far more nutritious twist on golden stovetop mac. Cashew milk, which is easier to make than you may think, makes a fantastic faux-cream sauce if you want to take it all the way to a plant-based dish, but feel free to use regular milk if you prefer." In a medium pot over high heat, bring about 4 cups of water with a pinch of salt to a boil. Add the pasta and cook according to the package's directions, to al dente. While the pasta is cooking, in a small pot over low heat, heat the cashew milk and coconut oil until the coconut oil is just melted. Stir in the sugar, mustard, onion powder, turmeric, and paprika. Remove the pan from the heat, add the avocado and lemon juice, and blend with an immersion blender until smooth. Add the salt and pepper to taste. Drain the pasta, and stir it into the avocado cream sauce. Serve immediately. "Cashew milk makes a great milk substitute in savory sauces. Make sure that you use raw, not roasted and salted, cashews to make your cashew milk." Put the cashews in a 1-quart jar, and fill it with water. Cover and let it sit overnight. Strain the water off the cashews and discard. Blend the softened cashews, 2 cups of water, and salt in a blender until you can no longer see pieces of cashew, about 3 minutes. Add another cup of water and blend for 1 minute more. For thinner milk, add up to another cup of water. "This recipe looks fancy, but it is stunningly simple. It calls for black cod, just because I think it's delicious, but you can use just about any roasted fresh fish. … Salmon, trout, and halibut are all terrific. You'll have a bit of leftover mash, which keeps great for leftovers the next day." In a medium pot over high heat, bring about 4 cups of water to a boil. Add the cauliflower and a pinch of sea salt, and cook until very tender, 15 to 18 minutes. Drain the cauliflower completely, place it in a medium bowl, and set aside. Season the cod well with the sea salt and pepper to taste. Preheat the oven to 425°F and place a large cast-iron skillet with the oil on the stovetop over medium-high heat. When the skillet is hot, add the cod, skin side down, and sear for 2 minutes. Flip the cod, skin side up, and transfer the skillet to the oven. Cook the fillets until the fish is opaque in the center, about 2 minutes more. Be careful not to overcook. Add the avocado and yogurt to the cauliflower, and using an immersion blender, purée the mixture until smooth, about 1 minute. Season with the sea salt and pepper to taste, and dollop a healthy serving on the middle of two plates. "Avocado makes a great upgrade to your daily sweet or savory yogurt. You'll be shocked at how silky your yogurt becomes! For savory yogurt, try topping it with salted pepitas, sunflower seeds, microgreens, or even as a dollop of unsweetened porridge. For sweet yogurt, try topping it with your favorite jam or fruit, or mix in a little cinnamon to taste." "If the idea of warm avocado intrigues you, this is a good recipe to start with. Just a little blast under the broiler to melt the cheese warms the dish just enough for the flavors to blend (but not enough to get bitter)." Slice one of the avocados in half length-wise, and remove the pit. Scoop out the flesh, place it in a medium bowl, and mash it until smooth. Add the bacon, green onion, and 1/4 cup of the cheese. Slice the remaining avocado in half, and remove the pit. Use a knife to carefully release most of the flesh from the peel, but leave the peel on. Top the avocado halves with the mashed avocado mixture, the remaining 1/4 cup cheese, and the salt. Place the filled avocados on a baking sheet, and broil until the cheese has melted, about 5 minutes. Serve warm. What are your top avocado hacks? Have you tried using olive oil to stop it from going brown, or do you use something else? Share them with us in the comments, and they might appear in another story on MyDomaine. *(c)2016 by Lara Ferroni. All rights reserved. 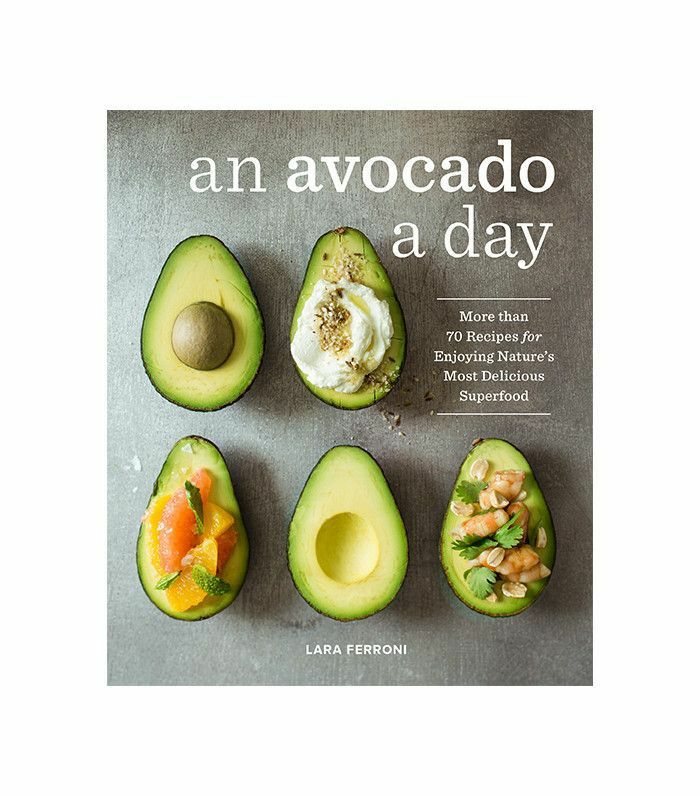 Excerpted from An Avocado a Day: More Than 70 Recipes for Enjoying Nature’s Most Delicious Superfood by permission of Sasquatch Books.